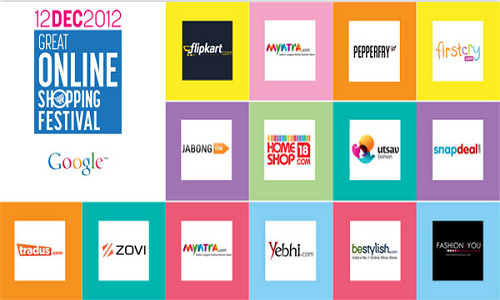 Google is about to push ecommerce to a next level in India tomorrow (12-12-12). When it comes to valuations I think Indian ecommerce sites have done a great job in pushing the envelope. Now everyone wants to see some real stuff. It is good to see Google taking this initiative and one has to thank all the participants (who all must be under pressure for increasing transactions which were promised in their business plans). Read more about GOSF here. The recently concluded Black Friday & Cyber Monday was a huge success in the US. It would be nice to have a detailed report of GOSF with some real numbers. GOSF (Great Online Shopping Festival) will not be anywhere near Black Friday & Cyber Monday, at least for now. The recently concluded Black Friday & Cyber Monday (Monday after Thanksgiving) had some interesting findings. Online sales jumped 26 percent on Black Friday to $1.04 billion from sales of $816 million on the corresponding day last year. Conversions are way up on online stores at 4.58%. That’s visitors who actually checkout and buy something. Up 9% from last year. Cyber Monday spending was up 17 percent year over year, and that overall, e-commerce spending for the first 26 days of the holiday season has totaled $16.4 billion, a 16 percent increase over last year. For the holiday season for the first 37 days of Nov-December $26.6 billion has been spent online, marking a 13-percent increase versus the corresponding days last year. Android has 52.5 percent of smartphone subscribers while iOS has 34.3 percent (source comscore). 55% of mobile devices in the US are smartphones but account for less than 25% of overall traffic. Mobile devices (smartphones and tablets) accounted for 16% of sales. That’s up from 10% last year. Mobile devices accounted for 24% of site traffic. Up from 14% last year. 77% of mobile traffic on Black Friday came from iOS devices. iPhones accounted for 9% of site traffic, up from 5% last year. The iPad generated more traffic than any other tablet or smart phone, reaching nearly 10 percent of online shopping. Android phones and tablets accounted for 5.5% of site traffic, up from 4% last year. Clearly iOS users believe in ecommerce more than Android users. 40% increase in social-media campaigns by its clients for the Black Friday shopping weekend compared with last year. Friday, a decrease of more than 35 percent from 2011. Twitter’s impact on ecommerce was zero.